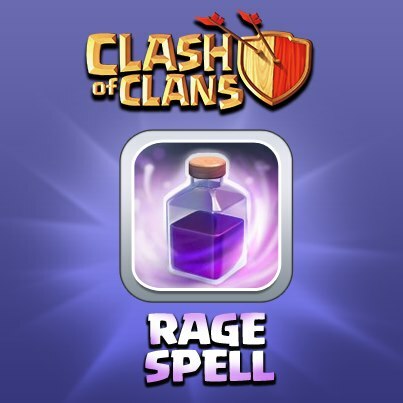 The Rage Spell is one of many Spells in the Clash of Clans game. Enrage your units to make them bigger, faster and stronger! Cast this to create a Ring of Rage! Your units will gain speed and attack power while they are inside this ring. It takes 30 minutes to create in the Spell Factory. The Rage Spell creates a translucent purple ring on a battlefield that boosts the movement speed and damage of any friendly units inside the ring. In the case of Healers, the Rage Spell increases their healing by a similar amount. Description of common tactics of usage a Rage Spell during the battle is Here. The level 5 Rage Spell can cause P.E.K.K.As to destroy a Town Hall within seconds. When used on Heroes, they grow to about twice their original size. The Rage Spell is substantially less effective when combined with Tier 1 and Tier 2 troops only, as they don’t do much damage as compared to the Tier 3 troops. Your primary target should be your highest damage troops, and any Tier 1 and Tier 2 troops it happens to affect is simply extra damage. The P.E.K.K.A and Balloon are especially well-suited for the Rage Spell, as they normally move and attack quite slowly. The Rage Spell’s effects do not stack, even if multiple rage spells are used on the same location. The Rage Spell’s ring of rage is significantly larger than a Lightning Spell’s ring, and is the same size as the Healing Spell. The Healing Spell goes well with the Rage Spell, due to the fact that it makes Troops faster and stronger yet healing them, making them much more durable. Although the Rage Spell can be upgraded to level 2 in the level 3 Laboratory, only Troops and Spells that are already unlocked will appear in the Laboratory upgrade interface. The Rage Spell will not appear in the Laboratory until the Spell Factory has been upgraded to level 3 (which requires Town Hall level 7). Most players already have a level 5 Laboratory by that time; if so, the first three upgrades will be available as soon as the Spell Factory level 3 upgrade finishes. If a hero dies whilst under the effects of the rage spell he will still appear at twice their size through until the end of the battle. Rage Spells appear to have a gridlock-like pattern on the edges of the spell when you deploy it and it will fade away once the spell expires. When a rage spell is dropped, it makes a “roar” sound. The 3rd July 2014 update made it so that Rage Spells have a lesser effect on the Barbarian King and Archer Queen. The Rage Spell is the only researchable item in the Laboratory that can be upgraded to the maximum level at Laboratory level 6. Consequently, it is the only troop or spell that can be maxed at Town Hall level 8 and thus most players have this as their first maxed (flaming) item in the player profile. The level 5 Rage Spell costs 3,000,000 Elixir (rather than twice the previous amount, 3,600,000), probably due to the fact that in the earliest version of the game, Town Hall level 8 only had three level 10 Elixir Storages. When the Spell Factory was first introduced to the game as part of the 18 Sep 2012 update, all Spells required Gold to create. 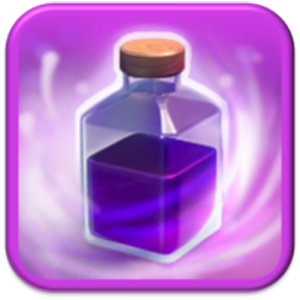 The 6 Nov 2013 update changed the required resource for all Spells, including the Rage Spell, to Elixir. The Barbarian King’s Iron Fist ability does not stack with the Rage Spell, nor do the nearby enraged Barbarians that are affected by the ability. In the game files, the rage spell is named as the haste spell. This is ironic to the 1 July 2015 update with the same new Dark Elixir Spell called the Haste Spell. The 1 July 2015 update reduced brewing time from 45 minutes to 30 minutes. A Goblin or Minion under the joint effect of a maxed Rage Spell and a maxed Haste Spell will move at a movement speed of 106 (13.25 tiles per second). Upgrade the Jump Spell to give your units more time to jump over walls.